The 'Justice' card is one of balance, truth, fairness and ultimately justice itself. In a reading 'Justice' encourages your actions and reactions to be fair, well balanced and objective. Your choices have long term consequences, be mindful of this and behave accordingly. Eventually we will all be judged and held accountable for our actions past and present, so remember, you reap what you sow. A balanced approach is possible, trust your intuition and the truth within you. Justice is another example of card which has changed little in its imagery, it has merely been updated and embellished over time. One element which I think has changed significantly however; in the Marseille deck the figure appears to be winged, suggesting that the figure of justice is probably an Angel. Possibly Saint Michael judging your heart and weighing your soul with his scales. But in later translations the wings appear to have become a throne, possibly a mistranslation of the image at some stage or a wish to move away from religious imagery. In the Rider-Waite deck the significant change was the numbering of the Tarot. This was changed compared to that of early/original decks and 'Justice' went from 7 to 11, to tie in more with astrology and represent Libra. Symbolism in the Rider-Waite depiction connects to well ordered thoughts, fairness and law. She holds a double edged sword representing impartiality and scales; representing balanced thoughts and the balance between intuition and logic. The imagery is simple and one of the least complex of the Rider-Waite deck. Before even beginning my Tarot works I made the early decision to revert back to the original numbering of more ancient decks. I was eager to return to the traditional roots of the numbering and honour its history. The decision was largely one of gut intuition and simply what I felt to be right for my deck. 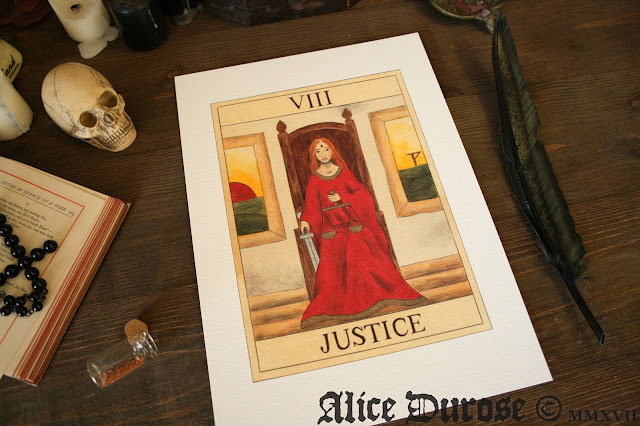 'Justice' was the last Tarot I began work on, my early ideas for it deviated little from its traditional imagery; simple, honest piece with a clear message and symbolism. This is essentially the approach I went with in the end, choosing not to attempt to over complicate and overthink the piece, I just went with what felt natural. It was of course unavoidable that eventually my beloved third eye would make an appearance in the series somewhere. And I must admit I feel that I was very restrained in saving it till last. 'Justice' was the one card that really cried out for the symbolism of the third eye, she sees all, the past, the present, the future and crucially; the truth. She holds perfectly balanced scales, representing fairness, objectivity, balanced thoughts and decisions. Justice judges you fairly and appropriately according to your own actions. The sword by her hand is ready to deliver justice and punishment as she sees fit. Her hand is resting upon the sword ready to strike, reminding us that the consequences of our actions are never far away. She is seated on a plain, honest throne, reflecting her own honesty and simplicity, yet the fact she has a throne at all elevates her above the norm in knowledge, intuition and her supernatural gift. The steps also serve as a tool to elevate her. Like the magician, her surroundings are simple and uncomplicated by lavish decoration. The two windows and their external view serve as a reminder of the power and potential consequences of justice. The new dawn brings positivity, reward and renewed vitality. Through the other window a gibbet looms on the horizon telling the viewer no ill deed goes unpunished in the balance of the universe.